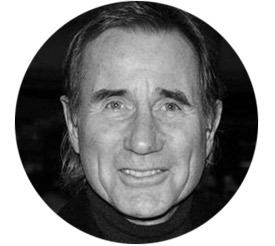 Jim Dale, MBE, was born in England and first went on stage at the age of nine. As an actor, songwriter and voice artist, Jim has been honored with two Grammy Awards, a Tony Award and an Academy Award nomination, the latter for his 1966 hit song “Georgy Girl.” He’s most famous for his roles in Britain’s long-running Carry On series and the Disney moviePete’s Dragon, as well as his stage performances in Scapino, Barnum, Me and My Girl, A Day in the Death of Joe Egg, Candide, and The Threepenny Opera. More recently he narrated the US edition of the “Harry Potter” audiobooks, winning two Grammys in the process. His one-man show, Just Jim Dale, received excellent reviews during its Off-Broadway run in 2014: “You’ll buy whatever Jim Dale is selling,” wrote the New York Daily News, “and the merchandise is first rate.” Jim has lived in New York for thirty years and is married to American gallerist Julie Schafler Dale.